Again, you can use either fresh pumpkin or canned, depending on your preference, the time you have to prep and availability of fresh pumpkins. Chocolate Pumpkin Cheesecake. Unfortunately I’ve never taken a picture of this delicious cheesecake but it looks as beautiful as it tastes with a layer of milk chocolate, a layer of pumpkin and a layer of dark chocolate. It’s fairly easy. And a winner (plus it totally impresses people with the different colored layers). How can you go wrong with chocolate and pumpkin and cheesecake together? Get the must have recipe here. Pumpkin Roll. Here’s another easier-than-you-might-think recipe that’s both equally impressive and delicious–spicy pumpkin cake with a cream cheese layer rolled together. You can make it ahead, too. Here’s the recipe. Pumpkin Drop Cookies. For cookies, these are pretty healthy with added All Bran (you can’t taste it! ), raisins and nuts. I also sometimes like to add craisins (after all, pumpkin and cranberries go well together, right?) and cinnamon chips or chocolate chips. These are a hearty fall cookie. I personally think they taste best after they’ve cooled, but they’re good fresh out of the oven, too. Here’s the recipe. No Bake Pumpkin Gingersnap Pie. This tastes a lot like an ice cream pie, but it isn’t. The gingersnaps add the perfect touch of just the right spices. You can get the recipe here. Pumpkin Dip. This light, flavorful dip is great with fruits, graham crackers and pretzels. You can make it two ways–with cream cheese or with frozen whipped topping. The directions for both are found here. Pumpkin Brulee. This recipe isn’t the typical dozen or more egg yolk variety of brulee. It only uses 3 egg yolks (to make approximately six ramekins) and is very simple to make. The small quantity of yolks makes it taste more like pumpkin pie than a super rich custard. But the crispy top crust of carmalized sugar is a nice addition. Here’s how to make it: Whisk together 3 egg whites with 1/2 cup brown sugar. Add 1 cup heavy cream and mix well. Whisk in 1 cup pumpkin puree. Add 1/4 teaspoon nutmeg, 1/4 teaspoon ginger, 1/2 teaspoon cinnamon and a pinch of salt. Fill 6-8 ramekins about 3/4 full of mix. Place them in a 9×13 casserole dish and fill with hot water (about half way up the ramekins)–being careful not to get water into the ramekins themselves (this just helps with even cooking). Bake at 325 for 30-35 minutes. You want it to be cooked and sort of solid, but it won’t be completely set. There will be a bit of wiggle left in it. Don’t worry about that part. Cool in fridge for at least 2 hours. 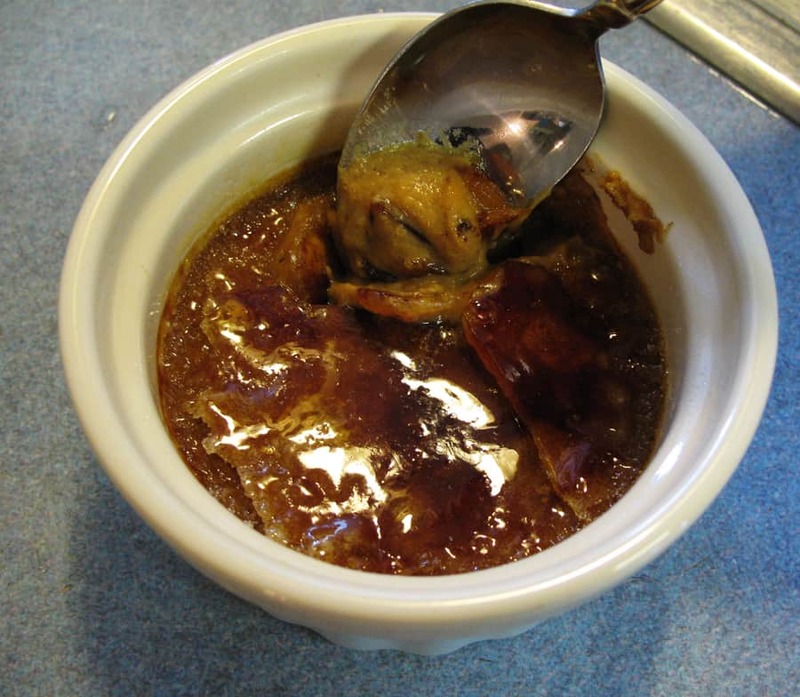 Spread 1-2 tablespoons of sugar over the tops of th brulee and either use a kitchen torch or use a your oven set on broil to carmalize the tops (the sugar will melt and form a hard a hard ‘glass-like’ crust that you actually have to break through with your spoon). Two Ingredient Pumpkin Bread. It’s true. Only 2 ingredients: 1 can of pumpkin and 1 dry spice cake mix. Mix the two together, spread into a loaf pan, bake at 350 for 30 minutes. That’s it. Can’t get much easier than that, eh? The cake it produces is very dense and moist. 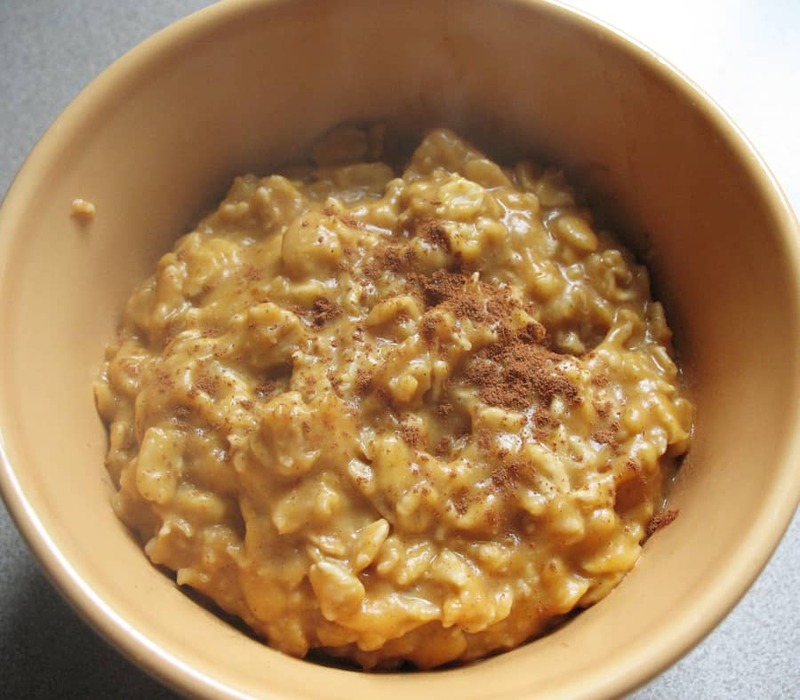 Pumpkin Oatmeal. Essentially, make yourself a batch of oatmeal but substitute all or half the water with milk instead. When it’s done cooking, stir in 1/2 cup pumpkin puree, a bit of brown sugar and a dash of cinnamon and nutmeg or ginger. Mmmmm. Good way to start the morning. I add a splash of milk before eating. It would probably also taste good with crushed walnuts or pecans on top. 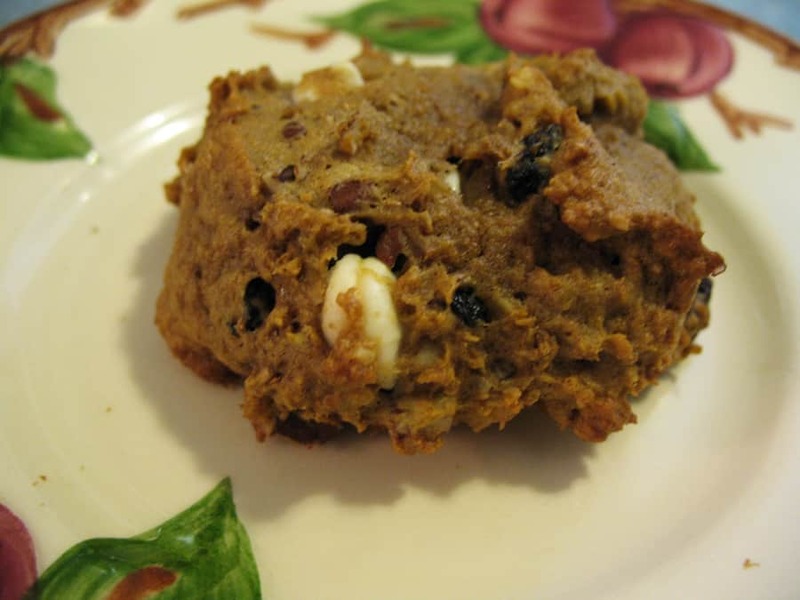 Crock Pot Pumpkin Cake. Okay, this is NOT a recipe I’ve tried, but I’m intrigued enough to WANT to try it…and because the cooking technique isn’t something I’ve done before with cake, I’m passing it along to you as well. It says to cook it inside a 2 lb coffee can (I’m not a coffee drinker, but do they actually even MAKE 2 lb coffee TINS anymore–I think they might be cardboard or plastic?) I thought maybe a suitable substitution could be a #10 can? That’s how I’m going to try it, anyway. Cream sugars and oil. Add eggs and pumpkin. Sift dry ingredients together. Add to wet ingredients. Add nuts and raisins. Pour into a well-greased and floured 2-lb coffee can (or #10 can or ?) Place in a slow cooker and cover top of can with 1/2 dozen paper towels. Place lid on top bake on high for 2.5-3.5 hours. The directions say: DON’T KEEP TAKING THE LID OFF TO CHECK! It lets out too much heat. However, you’ll have to take it off SOMETIME, to see if it’s done, which you can test with a toothpick coming out clean. 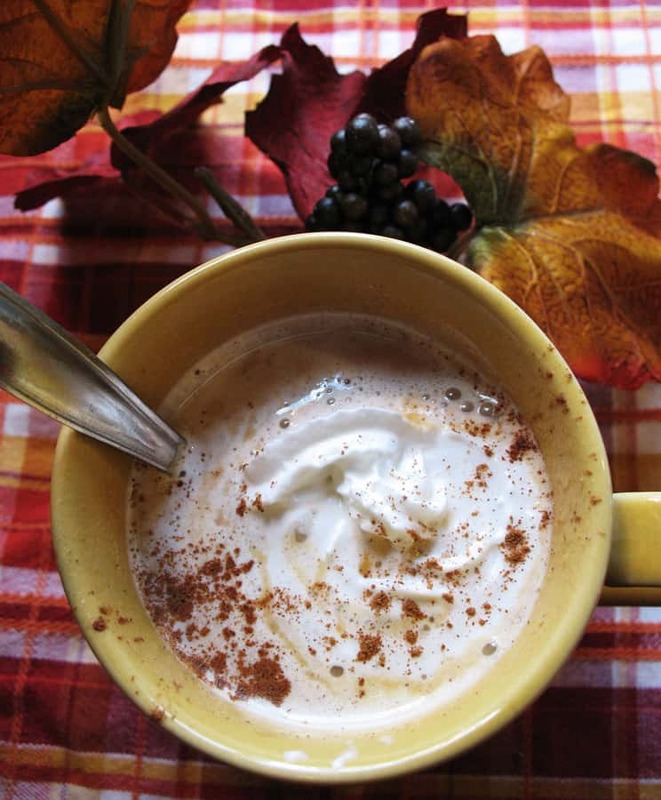 Okay, two posts of pumpkin recipes DID NOT use up all my pumpkin favorites. I’m sure you’ve got some favorites, too. Feel free to share them with us! One can never have too big a pumpkin experience!